The R-400 is the entry-level Trimming & Beading Machine. Available in 4 basic configurations including the standard set up for round parts only, with an inverter and/or gearbox or set up to work round and polygonal parts. The R-400 can work parts with a maximum diameter or diagonal dimension of 16″ and can utilize up to 3 slides. The R-700 is in the mid-range of Trimming & Beading Machine offering and has tremendous capacity to perform a variety of jobs. Available in 3 basic configurations including the standard set up for round parts only, with an inverter or set up to work both round and polygonal parts. The R-700 can work parts with a maximum diameter or diagonal dimension of 28″ and can utilize up to 4 slides arranged in an “X” pattern around the central spindle. This model is very flexible and can handle a large number of setups, truly a workhorse of a machine. The R-900 is the second mid-level Trimming & Beading Machine. Available in 2 basic configurations including the standard set up for round and polygonal parts with an inverter. The R-900 can work parts with a maximum diameter or diagonal dimension of 36″ and can utilize up to 3 slides. 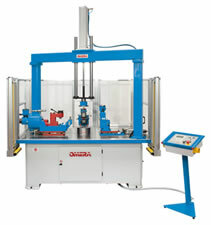 The R-900 is often equipped with a bridge presser column like the one pictured here, allowing for working on heavy duty parts with large thicknesses. The R-1200 is the 2nd largest Trimming & Beading Machine offered. The large table allows very large pieces to be worked with the larger slides required for rectangular parts. Available in 3 basic configurations with a range of options and installed power, the R-1200 is a solid machine that will work very large parts. The R-1200 can work parts with a maximum diameter or diagonal dimension of 48″ and can utilize up to 3 slides. The R-1600 is the largest Trimming & Beading Machine offered. This massive machine can work parts with a maximum diameter or diagonal dimension of 63″ and can utilize up to 3 slides. 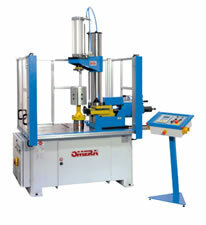 Available with several installed power options this is the king of the Omera machines. A specialized machine for the largest of parts. 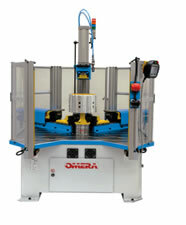 Specifically designed to the customer’s requirements in terms of both hourly output and required quality standards, OMERA Trimming Machines are both highly specialized and economical. The ability to draw upon over 40 years of experience and thousands of applications allows Omera to customize a solution that is specific for each client yet draws upon past experiences. This truly separates Omera from the competition and is why Omera ranks among the world’s unquestioned leaders in the production of these products. 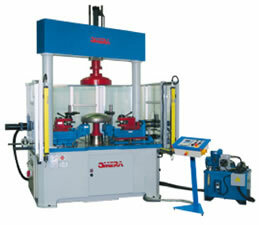 Mass-produced machines are customized according to the specific requirements of the client. 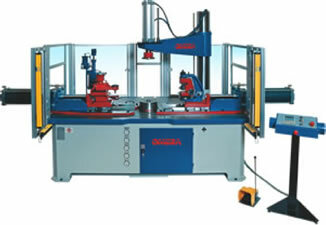 All Omera Trimming & Beading Machine models can be equipped with specific working units known as slides according to the kind of job to be performed. The standard slide pneumatic-hydraulic driven with optional hydraulic and/or brushless electric systems available as well.